The number with more digits is always the greater number. 1238 has 4-digits and 786 has 3-digits. a) Compare the thousands place first, which ever the thousands is greater that number will be greater. b) If the thousands are same, compare the hundreds. c) When the thousands and hundreds are the same, compare the tens. d) When the other digits are same, compare the ones. 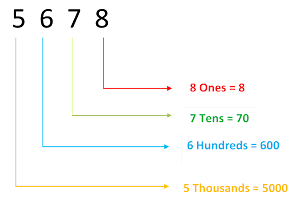 Place Value: The place value of a digit depends on the place where it occurs. The place value of the digit 0 in a number is always zero wherever the place it is. All Third Grade Comparison & Place Value Worksheets are printable for Free.